So the seasons are changing, days are getting shorter, leaves are blowing around, X Factor is back on the telly and my urge to hibernate is starting to kick in. Along with a change in weather, comes a change in the needs of my skin and it’s condition. Post Summer my main skin concerns tend to be that it’s dehydrated and a bit dull. Over the past few weeks through a few hectic periods at work I’ve been guilty of burning the candle at both ends (more from late night blogging than scandalous nights out) but with a hectic lifestyle comes the visible signs on my skin. So I decided to make the most of a few new skincare launches that have come my way and have a total skincare overhaul. Introducing a selection of new products all aiming to deal with dull, dehydrated skin and to help give your complexion a boost – including some products for anti-ageing and some designed especially for city-stressed skin. Exactly what I need in my life. A few of these are recent additions to the routine so my views are based on a couple of weeks use, others have been a little longer. If my first impressions change I will of course update. On the cleansing front I’ve been using two products from the new Shisiedo Ibuki* (Available from John Lewis) range – specifically designed for twenties skin, past the ‘oily/spotty’ phase but maybe not quite into the full anti-ageing phase but in need of a radiance boost due to the late nights, imperfect diet and city-stresses. The two cleansers are the Purifying (with exfoliating bits) and the Gentle (creamy, no scrubby bits) – these are quite unusual as to be honest my first impression has been mixed. They leave skin feeling really squeaky clean – but in that slightly ‘stripped’ way, like pure soap can do. But despite this initial feeling, I did like the properly clean feeling and my skin didn’t actually feel or look stripped at all – it’s more just the feeling when washing off the cleanser. But when I dry my face before moisturiser – it feels absolutely fine – smooth clean and not at all dry. So I have continued using these and they have really grown on me – they get rid of the city dirt but other than the during-rinsing squeaky clean feeling they have actually made my skin really happy. When I started using these I was having a bad diet/stress related break out and within days it had cleared up. Then on the hydration front – a huge priority for my skin. I have been also using two from the Ibuki range that on first impressions I didn’t think would be right for me – the texture is so light I suspected that they wouldn’t hydrate enough as I’m used to needing something heavier. But again, my first impressions were wrong and I’m really liking these – especially the Refining Moisturiser which I’ve been using day and night (mixed with the Protective SPF one for day) – it’s like a light gel/thick serum that soaks into skin and leaves it feeling immediately hydrated. Which I find amazing for something with such a light texture. Then for night time I’ve been using two new products – both of which have impressed me very quickly. First up the new Origins Plantscription Face Oil* (Available from Debenhams) – I love a good face oil, love Origins for skincare and already liked the Plantscription range, so I did suspect this would be a winner. And I was right – one or two drops applied to the face (plus a little on the hands to give them a bit of overnight TLC) and my skin thanks me for it in the morning – if you don’t already use oils in your skincare then I really suggest you give them a go – love them for cleansing as well as hydrating. They were one of the biggest discoveries I made as a blogger and haven’t looked back. 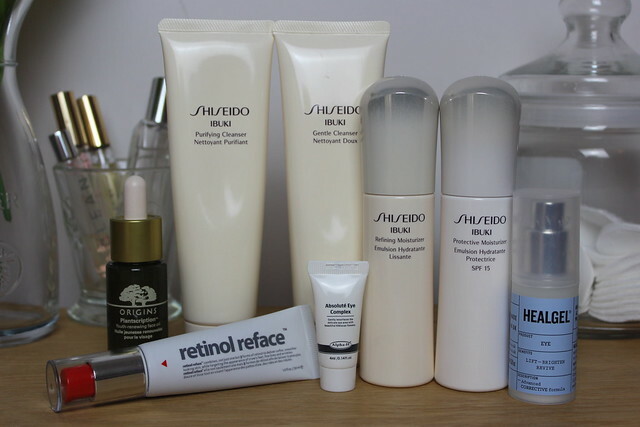 Finally – another new one ‘Retinol Reface*‘ (Available from Boots) from the people who blessed us with Hydraluron this is their new anti-ageing Retinol product. Retinol has had a bit of a bad rep in the past for making skin sensitive (it’s not one for use in the day as it makes skin more sensitive to sunshine) but as an overnight treatment for anti-ageing and as the name implied ‘resurfacing’ skin there’s been very little to rival it. This is one of the first Retinol products I’ve tried and I really like the immediate impact it has on my skin – I apply at night, sleep and wake up with skin that looks and feels smoother and brighter. For the eye area I have been loving the eye version of Heal Gel – ‘Heal Gel Eye’ (Available from Cult Beauty), a slightly lighter feeling version of the original Heal Gel that absorbs into skin, refreshes and leaves skin looking and feeling plumped and smooth. A bit of an alternative to a regular eye cream but I really like it. This one sits on my desk at home so I apply when my eyes are feeling tired from too much screen time and it feels lovely. Because it’s a light gel I find it’s a nice one to apply over make-up without ruining it too. I’ve been using this one day and night. This is described as an eye ‘treatment’ rather than a cream and aims to combat dark circles, shadows, puffiness, hyperpigmentation. It’s a clear gel formula and apparently can be used a primer (it is great for daytime) and applied over make-up during the day to refresh and have a nice blurring effect on wrinkles (yes please!) – basically I love this and will be repurchasing. It’s one I will use as a treatment and no doubt also use other eye products along side it but if your eye area is one of your skincare concerns, then I recommend you check this one out ASAP. So that’s a run down of the new additions following my skincare overhaul for Autumn. Loving the sound of the Shiseido skincare designed for people in their twenties – at 29 I can just about still get away with it! Also very interested in the Retinol Reface – I wonder if it will get as much hype as Hydraluron! Really want to try a face oil!